The first and last questions actually go together, so we’ll answer them at once. Think of Semana Santa as a week-long event leading up to Easter. In some ways it’s an extension of Easter, a religious celebration that basks in never ending food, family, fun, Easter gifts and yes even colorful eggs. However it goes far beyond that. Using the week to show some of very unique traditions that are a mix of Catholic and Christian, new and old, local and even imported. Where is Semana Santa Celebrated? As the world starts to “grow smaller” thanks to travel and the internet you can actually find people celebrating Semana Santa, or something like it, all around the world. 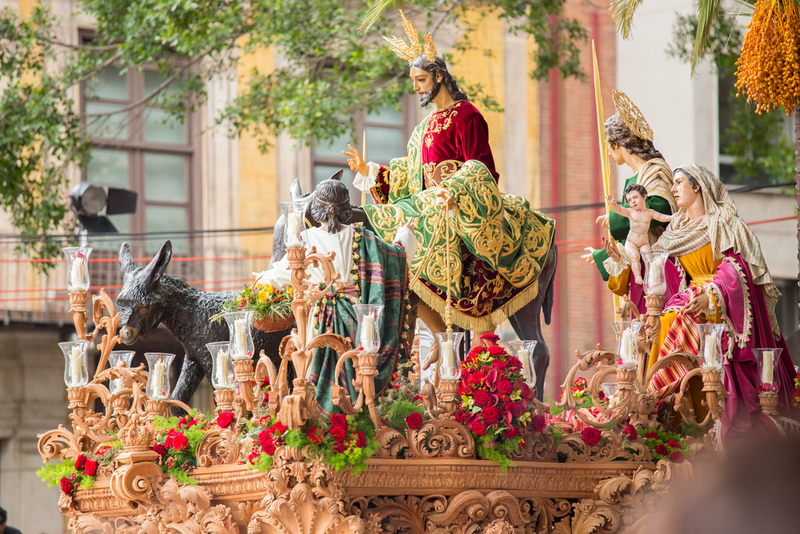 However this particular way of celebrating the holy week between Palm Sunday to Easter Sunday seems to have originated in Spain, then it spread. Now, people celebrate Semana Santa in Mexico, El Salvador, Ecuador, and Peru. How do People Celebrate Semana Santa in Mexico & Worldwide? As we mentioned before churches will hold special masses. Many cities will have large parades and floats filled with religious scenes and classic icons. What is most striking is the nazarenos, or penitents, who will walk along with the floats. Many of whom will even walk barefoot, as a sign of humility, and penance. This is all voluntary and should be seen as really impressive considering some of these parades can last up to 14 hours and people have been known to walk for the whole duration. In El Salvador streets are decorated with Alfombras de aserrin, or “rugs” made of colred sawdust, sand, flowers, and fruits in stunning designs. During Semana Santa in Mexico young boys carry streamers in parades while girls dress up in vestidos blancos, or white dress, for them. In Tarma, Peru, the city is filled with flowers for Semana Santa. Arches, rugs, and more, are made of flowers to bring spring to life inside the city’s celebration. And no matter where you are you have a reason to break out special food! 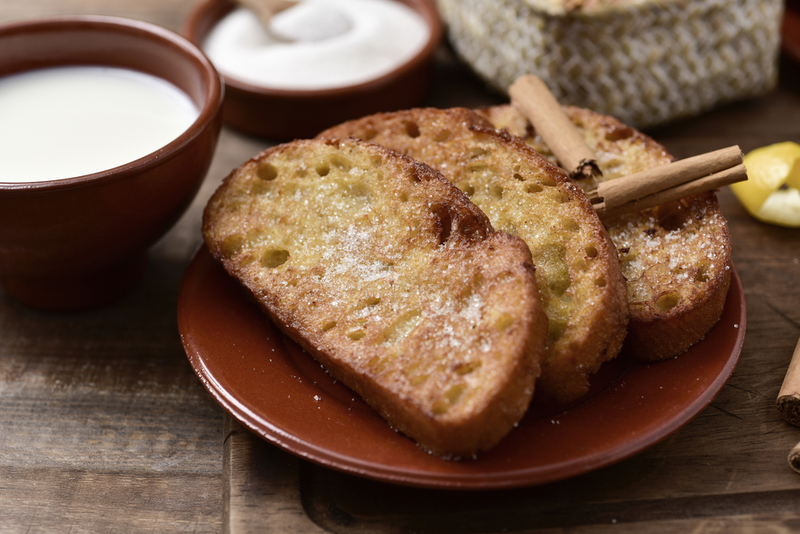 Some of the most popular dishes include Pesinos, basically a fried dough soaked in honey and very addictive! Bunuelos de Viento (homemade donut), bacalao and potato stew, chickpea and spinach stew, and torrijas! Your favorite loaf of bread for French Toast, I recommend a slightly stale French Bread but use whatever you prefer. Just keep in mind you’re about to soak it in something sweet, so a heartier savory bread is best. While that is going cut the bread into thick slices. Once the milk is cooked turn off the head, and soak the bread in the sauce. I find it easiest to poor the milk into a baking tray and dip the bread that way, flipping it over to make sure it is evenly coated. You don’t want them so soaked that they break apart, so not totally submerging the slices helps you control this. Set the bread aside on a baking sheet to rest and cool, it’ll allow the milk to seep into the inner layers of the bread and really settle. Heat up ½ an inch of olive oil in a deep heavy pan (I recommend cast iron) on medium-high heat. 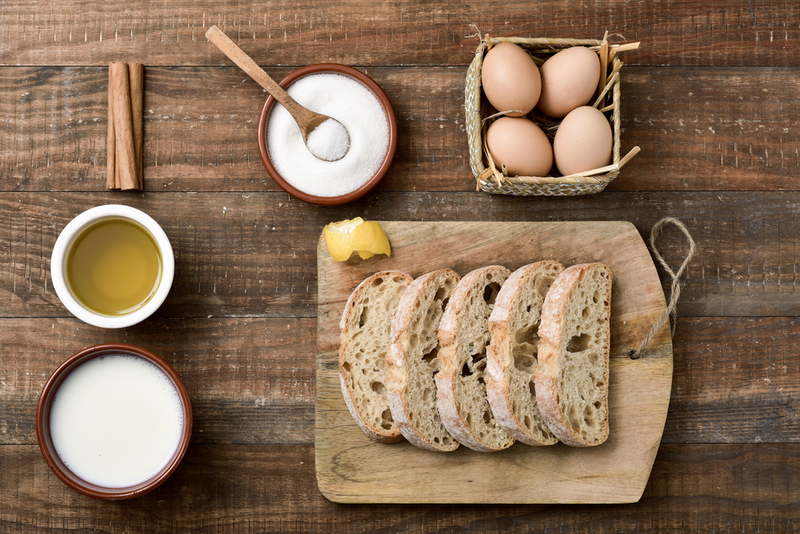 As this heats, beat the eggs in a shallow bowl and dip the slices of bread in the egg mixture. Fry the slices in your pan as you finish coating them (I can usually fit about 2 at a time, but your pan might be bigger). Flip them half way through so both sides are crisp. Personally I do mine for a minute and a half to 2 minutes per side, but if you like them crisper or even a little more burnt don’t be afraid to leave them longer. As they finish move them to a tray with paper towels to absorb excess oil. In a separate bowl mix ½ cup of sugar and the cinnamon together. Cover the rested cooked slices of bread with generously with the mixture, however there should be some remaining (about half) keep it for the next part. And now the best part, the syrup. Take the remaining sugar and cinnamon mixture and put it in a medium sauce pan. If it looks sparse, add a little more sugar so the bottom of the pan is mostly coated. Then add 2 cups of warm water and bring the mixture to a boil. Once boiling add the honey, if you really like a deep, rich, sweetness I recommended adding an extra tablespoon. The syrup should simmer for about 30 minutes. This isn’t an overly thick syrup that you see coming off of a shelf. It should be thicker than water, but easy to spoon over the toast. Allow the syrup to cool about 15 minutes before you spoon it over the toast. Make sure the bread is completely covered, but not drenched. Allow it to completely cool before covering and putting them in the fridge. Make sure you let them sit in the refrigerator for at least 4 hours, but overnight is best (which is perfect for making them ahead of time for breakfast). They will keep for 2-3 days in a sealed container in the fridge. If your family doesn’t sneak them all the very first day. With so many people living away from their loved ones, or traveling for work, sending gifts has become the go to way to be there in spirit when you can’t in person. For Semana Santa the most obvious choice would be anything you would send in an Easter Basket. Double down and simply make your Easter basket larger, and send it early! Include wine, chocolates, and teas to make sure there is enough for your family to share amongst themselves, and unexpected guests during this holy week. Add a few toys for the little ones. Adorable stuffed animals, puzzles, or building toys to help keep them occupied while the adults talk. If you know your family is too busy, or maybe too clumsy, to pull off an epic dessert for their family meal go ahead and send a cake or assortment of baked goods. Less dishes, and more enjoyment around the family table is ALWAYS a good thing. However you celebrate Semana Santa, even if you only celebrate Easter, a little extra love is always welcome. Be it a gift, phone call, or an old school letter. Use this week as an excuse to not only connect more to your religion, but also the ones that matter most to you in life. Because it’s not a celebration without the ones you hold dear. Now you know about Semana Santa, what next? Ready to send a gift to Mexico? We have you covered. Subscribe to our blog to get exclusive savings & be notified when we publish a new article.